The story is told in several acts, each with a specific focus and a few different dances within each one. A nice feature is the screens on either side of the stage, which give some more information about what's happening in each act and where the dances originate from, written in Korean, English and Chinese. This makes the overall story easier to follow, and while you can appreciate the dancing regardless, it's nice to have some added context. Most of the cast only dance to tell the story, but there are a couple of speaking "narrator" type roles, and while their dialogue is Korean, it's translated into English and Chinese on the screens again. The narrators are the funniest part of the show too, with their exaggerated gestures and intonation, skipping around the stage. The dances themselves are very impressive too, of course. The first half, the King and Queen's banquet, is mostly slow and stately dances, which initially I thought looked simple, but when you really look at what they're doing, their movements are so precisely placed and clearly well-practiced. In particular, when they move around the stage, they practically glide, with little steps that can barely be seen under their costumes. The fairy dance is especially pretty, with the use of fans, which flutter around as they move. The Queen's dressing scene is also a highlight, where a team of attendants dress her in a 16 layer ceremonial gown. The latter half is the performances of the common people, and the King and Queen sit in the front row of the audience to watch. Many of these dances are livelier, with more percussion, and more jumping and skipping around the stage. I like the food songs, which are fun and full of energy, and the crane dance is very impressive, with large leaps around the stage. The show finishes with the drum ensemble - the whole show is accompanied by traditional music, but largely offstage and unseen until now - and every cast member on stage has a drum of some sort, and they're all playing and dancing in unison, which makes for a very impressive finale. The costumes are almost worth seeing themselves, even without the performance, as they're all so beautifully colourful and detailed. The fairies have floaty, fluttery dresses, to match their fans and create beautiful movement as they dance. As mentioned, the Queen's ceremonial gown is a spectacle in itself as all the layers are carefully put on her. There's a group of drummers whose hats have long white ribbons attached, and they have learned to move their heads, while playing, to make the ribbons twirl and spin around them, which looks very difficult to do! There are masks used to create mysterious, even mystical figures. Many of the dances feature very long sleeves, much longer than the dancers' arms, which can be flicked through the air by small wrist movements. And the drum ensemble finale is a riot of colourful costumes moving around the stage. The staging is very simple, with the only props being ones the dancers carry, like fans or drums or plates of food, and the backdrop is created by computer images projected onto the screens behind the performance space, which is simple but effective. The show lasts about an hour and fifteen minutes, but even that seemed to pass by very quickly! Afterwards there is the opportunity to take pictures outside with the King and Queen, and a couple of other cast members, which we decided we may as well do while we were there. All in all, it was a great performance, and my words and photos here can only try to capture what it was like, but as with all forms of theatre and performance, you really have to see it to fully appreciate it. 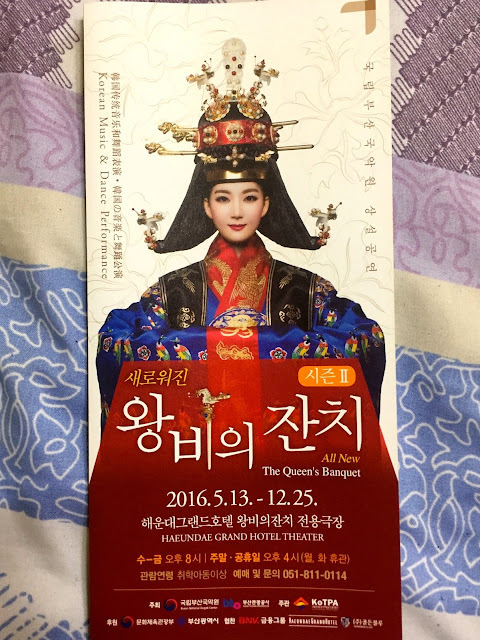 I would highly recommend the show for anyone visiting Busan!